Black Friday by Anurag Kashyap. You have heard of art imitating life. You have heard of realistic cinema. You have heard of commercial art house cinema. You have heard of film directors who make cinema that moves you, that emotes with you and takes you on a ride. Move over. There's a new breed on the block. Anurag Kashyap will take you on a ride like never before. 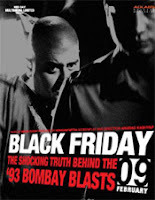 Black Friday is based on the book by the same name written by a Mid-Day journalist Hussain Zaidi. The book is a detailed description of the Mumbai Bomb Blasts of 1993. The book like the movie gives the point of view of many people involved in the incidents. The movie is more or less faithful to the book and brings life and more to the story. The movie is shot in a realistic and absolutely direct manner with an excellent cast made up of Kay Kay Menon as Inspector Maria(who features prominently in the book), Pawan Malhotra (as Tiger Memon) and Aditya Srivastav (as Badshah Khan, who turns informer). Being held up in court thanks to the cases filed by the accused, the movie itself took quite a struggle to reach the screens and what better timing then to come out just when the judgements are coming to a close ( or are they ?). The movie is absolutely brilliant in all aspects and could be a lesson in film making for our so called film makers. The opening sequence of the movie is breathtakingly shocking with its on actual location shooting and sudden action just like it would have happened in real life. The entire movie is almost flawless with great performances by one and all and heavenly music by Indian Ocean. Any movie aficionado must watch this movie. This is more than a documentary or a movie. It is a dark chapter in the history of modern India which is brought to life in light and shadows giving the point of view of multiple characters. The dilemmas faced, the conflict of emotions, the aftermath of the blasts are all depicted frame by frame. Having read the book and usually believing that books are always far better than movies in depth and impact, this movie is one exception. A must watch. Definitely a must watch!! Brilliant review , dude you are seriously getting good at this. Will watch the movie tonight and let you know how it goes.